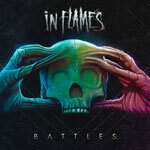 As noted before, In Flames is getting a good portion of pretty ugly words by quite a few of the people who initially were fans to the band during its early days. Even the fans who found out about the band during the period where the records c·o·l·o·n·y (1999), Clayman (2000) and Reroute To Remain (2002) came out have shown some disbelief over some of the latest of the band's efforts. All of this doesn't affect the guys in the band particularly because they write the music they want to make anyway and who can blame them for what they do when they're actually bigger than ever? Also I think that these guys have no problem with being called sell-outs or such words as long as they're this successful and going from the mid-regions way closer to the top is a reward good enough to keep doing what they feel like. Although sometimes even I have had my doubts about their huge musical transformation, I have personally for the most part supported the band's transition from the depths of death metal, via a lighter kind of metal over the years and all the way to being an alternative metal band at this point. To question that today's main songwriters, guitarist Björn Gelotte and singer Anders Fridén, aren't qualified to bring forward stuff that sticks like glue and produce songs with lots of great melody would be just nothing but ludicrous. The music mainly proceeds in some kind of mid-tempo, or a bit faster, with a modern appearance and with sing-a-long friendly choruses that will work great in a live environment, even if some divergent stuff is present on the record too. The sound picture is somewhat rough, but when looking at the whole production it's up-to-date with today's technology. I can understand that some people think that this costume is way too fashionable for the band, as the music might come out a little bit too computerized in some cases instead of sounding more alive and natural. I actually still don't know how Fridén always manage to find all these attractive melodies in the songs, because his clean singing is not strong at all and his range is limited in that department too. Maybe it's the deep angst in his expression that's making his voice come out valid in the end? Anyway, whatever he does fits the music behind him perfectly and if you want to really know what I mean; play it loud for God's sake! if not getting even bigger.